The Extended Care Health Option (ECHO) is a program offered through TRICARE, the military health care system. ECHO may help some military families who have a family member with special needs. ECHO focuses on integrated sets of services and supplies beyond those available through TRICARE programs. Services are intended to reduce the disabling effects of a beneficiary’s condition. ECHO is only available as a supplement to TRICARE programs. If services or supplies are available through a beneficiary’s TRICARE plan, they won’t be covered under ECHO. NOTE: if a family is also trying to access Medicaid services, ECHO pays first, and Medicaid is the secondary payer. Applied Behavior Analysis (ABA) services through the TRICARE Autism Care Demonstration, a program scheduled to run until Dec. 31, 2023. WHICH MILITARY FAMILIES ARE ELIGIBLE FOR ECHO? Family members of activated National Guard/Reserve members. Family members of deceased active duty members while they are considered “transitional survivors”. The transitional period lasts three years for a spouse; children remain beneficiaries until they age out of TRICARE eligibility (age 21 or age 23 if enrolled in a full-time course of study at an approved institution of higher learning and if the sponsor provides over 50 percent of the financial support). A child is considered to be the biological, adopted, and/or stepchild and/or spouse’s child resident in the sponsor’s home or for whom the sponsor has a legal obligation. Family information must be up-to-date in DEERS (Defense Eligibility and Enrollment Reporting System). The family member to receive services must be a TRICARE beneficiary. The family must be enrolled in the Exceptional Family Member Program (EFMP) if the military member is in any branch of service other than the Coast Guard. This mandatory enrollment is only for the “medical” section of EFMP. The family may also decide to sign up with the “family programs” section. The TRICARE regional contractor, in concert with the family’s primary care provider, will determine any evaluations that may be needed to qualify for ECHO services and refer the family to necessary specialists for the evaluations. Eligible family members may be granted provisional ECHO status for a period of no more than ninety days as they wait for their application to be approved. 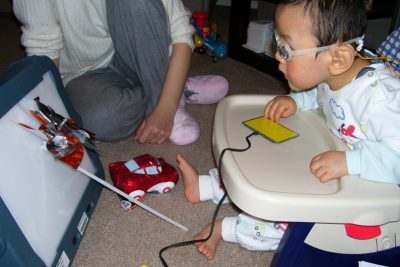 Assistive technology devices and training for families to use them. Specialized residential services and transportation to or from such services: regional contractor must be contacted to find out if transportation can be provided. ECHO Parent Handout -Add your Parent Center’s logo!